When your family or guests gather in your dining room, you want to set a certain mood. Nothing does this better than the proper furnishings. 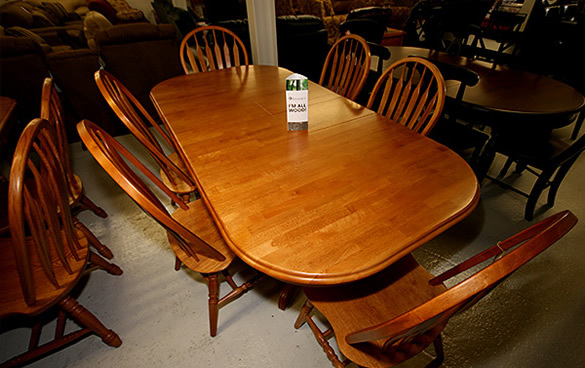 Better Homes Furniture has a diverse selection of dining sets, from traditional to modern styles. Our dining sets come in many varieties including the traditional woods, such as cherry, oak and maple. We also have other styles featuring glass and faux-stone tops on wood and iron bases. And we don't just offer dining tables and chairs. Our 12,000 square foot showroom also offers an array of dining room pieces including bar stools, kitchenettes, and much, much more. We have something for every style. Also, if you see something you like at another store, please know that we can probably order it for you at a better price. We never upcharge for custom orders! So come by our North Wilkesboro store and see our huge selection of dining room pieces. Remember, we offer delivery anywhere in Wilkes or the surrounding counties including Ashe, Avery, and Watauga.